Click this link to see all the great Design Choices! 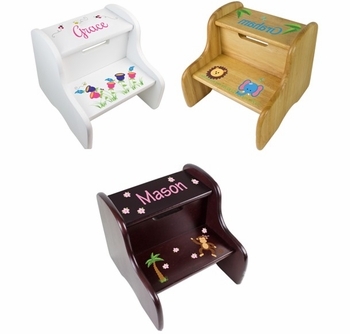 Give "Little People" a boost to the counter or sink with one of these adorable personalized baby gifts! Our tallest step stool has two steps to assist in reaching the sink, shelves, or bed, giving kids more independence and it makes a great birthday present for older kids too! Available in White, Natural and Espresso. Each stool measures 10 3/4 inches high by 11 inches wide by 12 inches deep.The top step is 10 inches from floor. Imprinted with permanent non-toxic ink. See More Images above to see all three finishes. Please note: Some minor assembly is required. Assembly is easy and takes 5 to 10 minutes. Free shipping included. Our daughter-in-law thought it was adorable. While I had a chance to finally breathe, I wanted to let ya know that we got the stool in time for the birthday party on Saturday.... it came while we were gone to a soccer game for another grandchild. Got home to change clothes for the party and there it was!!! So many great comments about your quality.... I shared your contact information. Our daughter-in-law thought it was adorable. I had such a great experience buying from this site. 1. When I ordered this stool, I purchased it without calling them. The stool I ordered was out of stock. The nicest employee called me and walked me through my options. 3. It came in with a week until the photos. 4. The quality is AMAZING. There are no sharp, blunt edges. The paint job is wonderful. The expresso finish looks amazing. The pictures do it great justice. This is late in reaching you. I wanted to let you know what a great gift this step stool is . My sister bought this for my daughter and sent us a picture since she ordered it very close to the holidays and wasn't certain it would arrive in time. The step stool looked nice in the picture she sent us, but we were really impressed when we received the step stool before Xmas. The design and name really popped against the espresso color. My daughter has been using it to brush her teeth and help mommy in the kitchen . We are actually talking about buying her another one, so she doesn't have to drag this one up and down the stairs. This step stool has become my favorite "go to" gift for all of my friends and family. It's practical and fun and I can see us holding onto it for keepsake purposes. Before I get into the review of the actual product, I want to say that the customer service is absolutely wonderful. 10 minutes after I purchased the product, I received a phone call because they wanted to inform me that the product may or not make the event date (a week and a half away from purchase date). I was aware of this, but had informed the person I was giving it to, that it may be a little late. However, Simply Unique Baby Gifts did all they could to get the product out as soon as possible. The stool got there a just few days later! It was perfect and the kids loved it! The kids already started using it when brushing their teeth!